First, the no. As anybody who read my blog rants during the last few years I was at Vanderbilt, it comes as no surprised that I was stressed near the breaking point. I was in a fairly deep depression; although it would come and go, sometimes being worse than others, I think I was struggling with it fairly constantly for the last few years at Vanderbilt. The mixed messages were crushing. I would go give talks at other places as part of the AAS Shapley lecture series (in 2006-2007, I was one of only three Shapley lecturers who were to be invited to give five talks, and the other two are were relatively “big names”); there, people would tell me, “you will have no problem getting tenure!” The lectures would be extremely well-received. Several years ago, at Vanderbilt I won the Chancellor’s Award for Research. Yet, at the same time, my grant proposals to the NSF were not getting funding, and I was receiving the word in no uncertain terms that without grant funding at that level, my chances of getting tenure were in the few percent range at best. Most of the feedback I got indicated that I was doing my job very well, but I was also told that I was going to be judged as unworthy when it finally came time for the University to speak it’s piece. (Sure, I wasn’t perfect; the lack of grants was an indication that I wasn’t doing everything right. There were some students who really didn’t like me as a teacher, although overall the teaching was going very well. I take some heart in the fact that those who have won teaching awards also get some students who really hate them.) These mixed messages led to a deep malaise within me, led to a lot of suppressed anger and bitterness, and drove me in and out of a pretty deep depression. Partly as a result of that (combined with my switching research focus half-way through my pre-tenure career), my research productivity drooped; everything felt so futile that it was difficult for me to get myself to drive a project to completion. When I left, I had three or four projects that were partway towards a publication, but I hadn’t had any first author publications in three years. That’s not good. I wasn’t able to stand up under the slings and arrows that were being thown at me. It wasn’t that I was doing nothing; what I did was throw my heart more into my teaching and my advising of students. While I didn’t have any papers published, I did advise more undergraduate honors theses than anybody else in Vanderbilt’s Physics department during my last few years there. While most people, once they figure out how to teach a given class, rely on their notes for a long time thereafter, I re-thought from scratch my approach to teaching the introductory astronomy class twice, trying to make it a better course. I paid attention to astronomy education research. I gave a lot of public outreach talks (including those as a part of the AAS Shapley Lecture series). Does it sound like I was at the wrong place? I was too interested in teaching and advising undergraduates, to my detriment at a place that values research prestige and research funding first. Do I miss it? Well, I’ll tell you this much: I’m happier, more content, and more comfortable in my life right now. I’m less stressed in a deep and abiding sense. I feel like I’m doing my job well, and that I’m getting feedback that matches how well I’m doing at my job, and that doing my job well is what matters– there’s no Sword of Damocles hanging over me saying that I will be judged unworthy because of something mostly out of my control (i.e. funding). While it would be wrong to say there’s no politics, the politics is not as nasty and as underhanded as academic politics. While it would be wrong to say there’s no ego, they are not as irritating as the egoes and self-importance of certain selected people in academia. I’m in a much happier place. I do miss surfing at the cutting edge of astronomy research, although I’m sort of starting to at least be a hanger-on there with my participation in MICA, the Meta-Institute of Computational Astrophysics. I don’t miss actually doing the research, because the technical challenges of what I’m doing for Linden Lab satisfy the same sorts of things that the technical challenges of research did. So, yes and no. I’ve stepped of of the path that would let me be able to be in a position that I feel is my true calling. On the other hand, I’m out of the awful soul-crushing ratrace that is pre-tenure at a research university. I’m really enjoying what I’m doing right now, I really like the people I’m working with, I’m very fulfilled by what I’m doing… and, it’s entirely possible that I’m helping to build The Future. What’s more, it allows me to have a lifestyle that is less stressful, and less all-consumed-by-career, than what I had before. In retrospect, it was almost certainly a mistake to take a job at a research-oriented University. I knew, even in 2001, that I’d rather be at a small liberal-arts college that was teaching first and research second, rather than one that was the other way around; but, alas, Vanderbilt was the only offer I had. So I’ve scattered out. It was the right decision for me to do; Linden Lab is a better place for me to be than Vanderbilt. But, a part of me still does regret that I’ve left behind my life’s work, and a part of me still does regret that I didn’t really have the opportunity to make an even better decision. I’m in sort-of the same position you might have been in awhile ago, where I love the research I do very much, but in a 20-to-40-hours-a-week type of way, not in an all-consuming type of way. Is there a way to balance that with the other academic interests (teaching, outreach, adult education, public lecturing, science writing) and non-academic interests (plenty of time to pursue non-career related things)? Moreover, just because you’re not paid to be an astronomer/astrophysicist, does that mean you’re not an astronomer/astrophysicist anymore? It’s very interesting to read your personal perspective on your career. Thank you for sharing it with the blogosphere. I would say that you *definitely* don’t have to be paid to be an astronomer/astrophysicist to be one. However, since most of us do work 40 hours a week or so at what we are paid to do, we only have so much creative energy left over, so it’s very difficult to really put even quarter time’s worth into astronomy research if you’ve got another full time job. That being said, Ethan, in *any* event you should check out MICA, whether you continue in astronomy or not. There are people like me– PhD’s who were former professionals, and still want to stay involved– as well as active faculty members, and interested amateurs. It’s all in Second Life, so we can be anywhere in the world and still participate. We’ve got regular public talks, journal clubs, and the like. 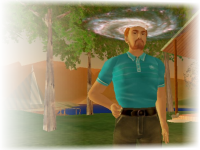 The people in the group are dominated by computational astronomers who work on N-body simulations… and, indeed, they are doing some exciting things by replacing the physics engine in the OpenSim virtual world software with real N-body software. The SCP is about to publish another paper including some data that I worked on a few years ago; I’ve asked them to list MICA as my affiliation. Piet Hut, the main driver behind MICA, thinks it may not be too far off before MICA has their own post-doc, or something like that. He hopes that this will be a way to make it more possible for people who are no longer paid to be an astronomer/astrophysicist to continue to be a real astronomer/astrophysicist at some level. Such a frank and thought provoking expose of both your life and the life you had in academia. Thank you for writing it as it echoes similiar feelings many of us have about our working lives in academia or the commercial world. I recently joined MICA VW after attending an SL presentation on an Astrophysical topics. I am student coming to the formal study of Physics very late in life for a variety of reasons I won’t go in to. The interaction you and your colleagues have provided in the coffee mornings and meetings (I attend whenever I can), have been inspirational and a phenomenal boost to someone trying to find there way through this subject. I say this to express to you that your teaching, although perhaps not in a formal setting, still continues to reach those that really care about what you and others in the Phsyics and Astronomy community are doing. I tried to check out your link to MICA, but it’s broken in the post. This is so insightful and personal, and so much of it rings true for me that, and I hope you don’t mind, I wrote about this article on my own website. I’m glad you’re finding a way to still (somewhat) satisfy the variety of needs that you have, while finding more room for happiness and non-academic pressures in your life. I don’t know what to tell anyone about the funding situation, and how your career’s future is determined by something that you have no control over; you adequately express the frustration that many people have with that. I wish you luck in someday getting the offer from Fisk or Belmont that you want. Your story really reminds me a lot of what Albert went through when he finally made his decision to leave the newspaper. He loves the newspaper business, loves writing and reporting, but the newspaper he left wasn’t the newspaper he went to work for ten years ago. The things he valued about the job were no longer important to the people running the paper. But even though he made the right decision (as I think you did, too), he still misses the paper a great deal. It gave him so much more creative satisfaction than his day job and he knew if he wanted to he could have made a career out of it. But the cost of the career would have been me and Boo, and he didn’t want to do that. But it’s still hard, and he still gets down about it sometimes, even knowing that he did the right thing. Happy to see that you are enjoying your new position, Rob. Good on ya!